If a stranger does approach then it is usually a rather elderly lady trying to squidge El’s super soft chubby cheeks. Now I’m not a complete germophobe but who the hell are you and where have your hands been?! The latest cheek poker was an old lady who told me I must read my baby Shakespeare because her son has made it to his forties… I had thought she might tell me he was a Dr or some other admirable profession but it was just that he had got to forty… I then had to stand in a cake queue while she recited endless Shakespeare at El. (I may have ordered first and left my friend to listen to further recitals…sorry not sorry!) The worst poker was an old man in a checkout queue who got quite angry when he told me he didn’t have any grandchildren so I tried a sympathetic ohhh… But then he came close and actually poked her face!!! While saying ‘I could be your grandad!’ Errr NO! Cue me turning round to look very busy with a plastic bag. I had a good outing to Tesco earlier this week where I came out feeling I had spread some joy! (And yes a trip to Tesco counts as a whole entire outing when you have a baby. We’re dressed and we’re out!) If baby El is happy then we might as well peruse the baby clothes, check for cake deals and what not…as long as it doesn’t involve standing still because that isn’t allowed (I will get a shriek in the face if stationary for too long – so you may see me circling the same rack of clothes while I try to make decisions.) People smiled warmly as they noticed there was a mini me strapped to my front. A little ‘she looks cosy’ or ‘ahh cute’ as we went on by. I realised I even know Italian as I overheard one couple go ‘ooo Bambino!’ Little kids would say ‘Mummy! There’s a little baby!’ My particular favourite was ‘Mummy why’s that baby in her mummy’s top?’ And the best bit about Tesco – no weirdos touched her! I like to think that my baby is so adorable no one will notice the state of me. I will spend time making sure El is fairly clean and in a cute number but there isn’t always time for me… my best efforts now are a tinted moisturiser and eyeliner (not the fancy liquid kind, just a pencil under the eye). So appreciate my baby… but don’t look at me! 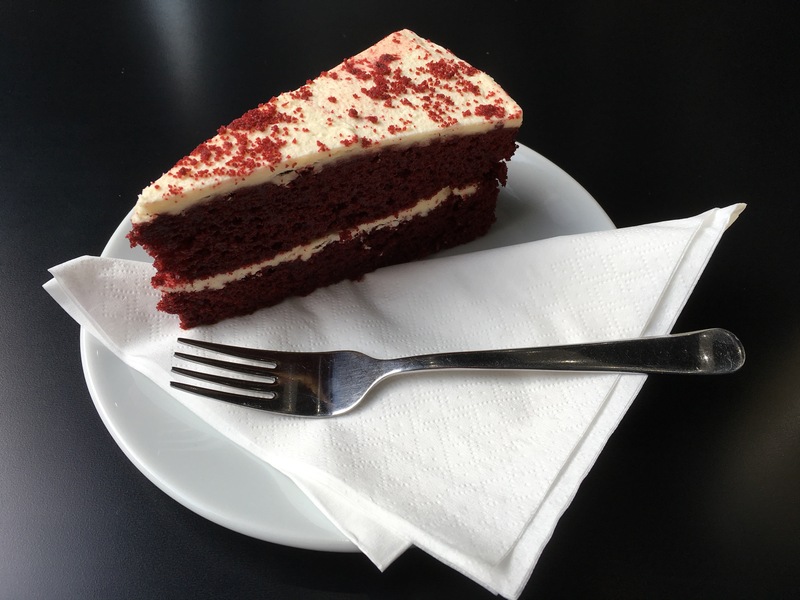 My latest cake consumption was a slice of red velvet from Senzo (Epsom). The cream cheesy icing got me thinking I need to eat cheesecake soon… pretty darn good! Today was a fairly standard weekday for me. Meeting up with one of my new mummy mates in a cafe. 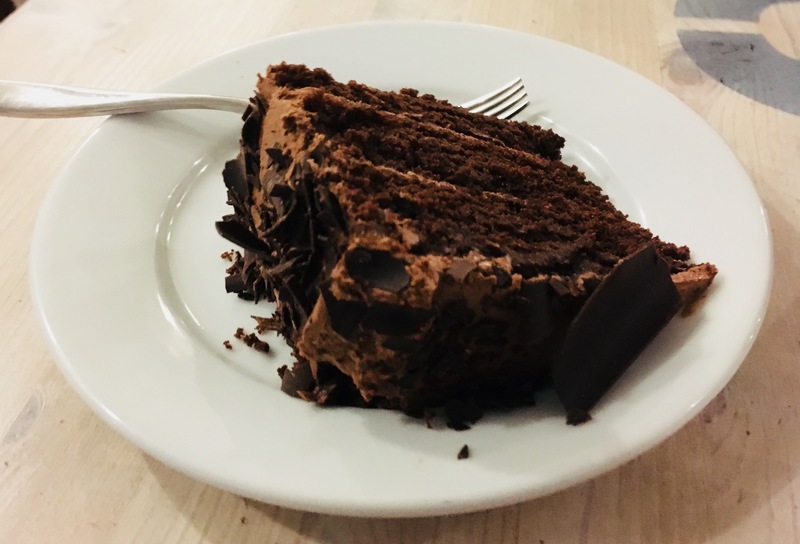 A cafe with good cake and pram space (obviously). Not that the pram space is for me because why would baby El want to lie in a pram when I can carry her around like the princess she is! (The carrying is mostly done by sling, I don’t just walk down the street carrying her in my arms…but I have done that too.) Also, if a new mum doesn’t eat cake then I don’t think we can be friends… just saying! If you don’t like cake or go on a diet with a newborn then you cray! My mate today was one I met through the awesome app Mush! My ‘Mush’ing has decreased since I feel I have now reached a satisfactory level of mum mates that I am very fond of – just enough to have a little outing most days and WhatsApp about poo or cake, but not too many that I can’t keep up. Mush was very addictive in the first weeks of baby El’s life as I fed her at 3am terrified I’d never go out or find anyone to be baby besties with. I find striking up conversations with a group of strangers rather terrifying so Mush has saved me from rocking up to local baby groups trying to hit on new mums by giving them the eye. Meeting up with new Mummy friends is just like dating, only instead of worrying about what you are going to wear there are now two of you to get dressed! Luckily there is always motherhood in common so conversation can flow (as much as it can when you’re holding a very temperamental being). And then you go home and wait for their text to see if a second date is on the cards. There is of course the antenatal group but with El being so early we missed most the classes and it was nearly 3 months before all the babies were born. You also don’t get to select the people attending your antenatal classes so you can end up with all sorts… luckily I met some gems, even if their babies took their blooming time getting here! These new friends have been vital! No matter how much you think you know about babies you can’t imagine the crazy thoughts that will pop up once your baby is here. They calm you down instantly when you hear their baby also started pooing vinegar. They know how it feels when you’ve had a night of hourly wake ups! They help you laugh it off when you are sat on the floor in a packed cafe covered in the vinegar poo. They casually point out your babies been a bit sick while you’re too busy chomping on cake. And they just smile kindly when you are bobbing around like a maniac in a cafe because your baby has gone mental (not the looks of death you get from strangers who think you must have pinched them – it’s a baby they just lose their sh*t sometimes!) Always there to pick you up after a tough day (or night). I love my new friends! Apologies in advance for bad language/grammar, time is of the essence with the ticking time bomb that is baby El. Living life on the edge ready to tend to my baby’s every beck and call. No leaving the baby to ‘cry it out’ here!